Macau, August 4, 2017 – Alibaba Group (NYSE:BABA), the world’s largest online and mobile marketplace, today announced that it and the Government of Macau Special Administrative Region (Macau), have entered into a strategic partnership framework agreement, under which Alibaba will support Macau’s transformation into a smart city by using cloud computing technologies in order to bring benefits to both residents and tourists visiting the city. 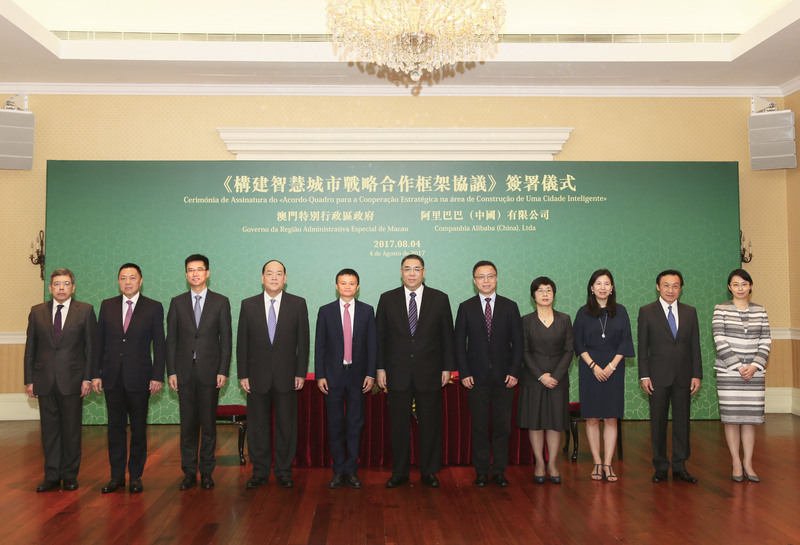 The Chief Executive of Macau, Mr Chui Sai On, and Alibaba Group’s Executive Chairman, Jack Ma, witnessed the exchange of the Memoranda of Understanding in Macau. By leveraging the advanced technologies provided by Alibaba Cloud, the cloud computing arm of Alibaba Group, the parties will collaborate in upgrading the IT infrastructure in Macau to foster developments in tourism, transportation, healthcare, governance and talent development. Smart transportation: The parties will build a smart transportation network for the city to optimize the management of road, water and air traffic, making the most effective use of Macau’s transportation resources. Alibaba has a proven track record in smart city development which this newly announced collaboration will seek to build on. One example is the Hangzhou City Brain, which was launched in October 2016 based on artificial intelligence and deep learning and reduces traffic congestion by sending out instant traffic alerts and route suggestions to users by real-time prediction of traffic movement. This transportation management system, piloted in Hangzhou’s Xiaoshan District, has increased traffic speed by as much as 11%. Established in 2009, Alibaba Cloud (www.alibabacloud.com), the cloud computing arm of Alibaba Group, is China’s largest provider of public cloud services in 2016 by revenue, according to IDC. Alibaba Cloud provides a comprehensive suite of cloud computing services to businesses worldwide, including merchants doing business on Alibaba Group marketplaces, start-ups, corporations and government organizations. Alibaba Cloud is the official Cloud Services Partner of the International Olympic Committee.